"I want to adopt an old dog, one that no one else wants"
This is a beautiful, heart-warming story just in time for the holiday season! 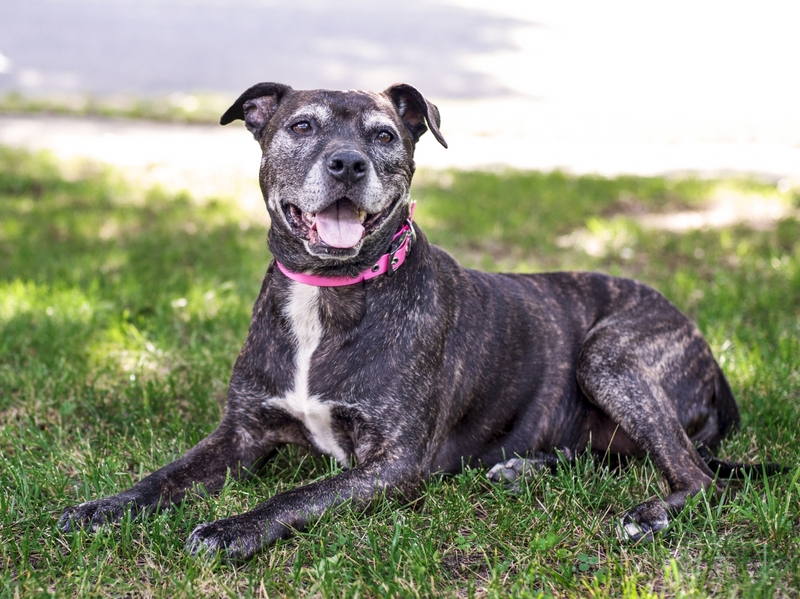 Kaylee, an eleven-year-old American Staffordshire Terrier who lived at BARCS Animal Shelter in Baltimore, finally found her forever home when a nine-year-old made the decision to "adopt the oldest dog at the shelter". Raven, the child of Melissa Davis, told her: "I want to adopt an old dog. One that no one else wants." Melissa was touched by Raven's wish, but she wanted to make sure that Raven knew how hard this might be. An old dog, she told Raven, would not be around very long. Adopting an old dog is a wonderful thing to do, but it can also be emotionally difficult. Raven, however, was not to be swayed, telling Melissa: "I don’t want [dogs] to die in the shelter. They don’t deserve to die alone." So, happily, Kaylee was welcomed into the family. There was indeed some emotional hardship. Kaylee had cancer, and was given a prognosis of only having two months left to live. But Raven's family was determined to give her the best two months of her life. They set out to create "Kaylee's Bucket List", and to fill her life with joy and love. In return, Kaylee enriched their lives as well. Melissa's story was submitted to the Petco Foundation as a part of the annual Holiday Wishes campaign --and it won! Her prize: the amazing opportunity of helping out Kaylee's former shelter home. The BARCS Animal Shelter won a 2017 Holiday Wishes grant of $10,000 to support dogs still living at the shelter. On top of this, Kaylee's story won the grand prize of the Petco Foundation Holiday Wishes People’s Choice Awards, which was a grant of $25,000. Kaylee's old friends at BARCS now benefit from $35,000, and are able to use these funds to support dogs who have not yet found their homes. As for Kaylee, she has since passed the two month mark. She still suffers from certain health issues, but she has received the greatest gift of all: a home, and love from a family. Thanks so much to Melissa and Raven's family for taking a chance on a senior dog! As Raven's wisdom indicated, every dog deserves a loving home, no matter their age. For more information on the Petco Foundation Holiday Wishes visit HERE.